A water bug is collectively any one of a number of insects that prefers to live in damp areas of the home or yard. 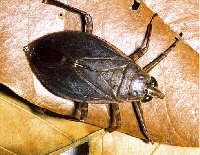 The term "water bug" is commonly used to refer to a type of cockroach. The term 'water bug' is used because the term cockroach has such an off-putting connotation, implying that someone's home is dirty. Whatever you want to call them, no one wants them in their home. So, how to get rid of water bugs, which are certainly unwanted inhabitants? Eliminating them entirely is a big challenge. The true water bug is a roach -- yet somewhat different from the roach. It is considered an aquatic insect. It uses its legs to paddle through water. The water bug that is completely aquatic is a member of the Halobates family, whereas the pests seen in your house are from the order Hemiptera. Water bugs prefer damp areas over dry spots and, consequently, like hanging out in bathrooms and kitchens.The Oriental and American cockroach travel from sewer systems into residences. The Oriental cockroach prefers staying in crawl spaces and the basement, where the humidity is high. Water bugs also live around the perimeter of the home. They manage to make their way inside, feeding on plant material and decaying organic material. They are not picky and will consume most anything. They are considered scavengers. Removing mulch and dead leaves lying close to the house is one way to battle the population. Garbage cans should be in dry not moist locations. This helps. Homeowners can use residual pesticides or granules on the outside perimeter of their home to battle these bugs. To be effective, this must be applied more than once. Take a consistent approach to tackling these annoying creatures or else they will multiply. Using roach bait is the best method for combating this issue, particularly the indoor population. However, a roach spray can be used around the exterior of the home to wipe out the outside population, or at least minimize it. The roach bait contains a slow-acting insecticide incorporated into a food attractant. The bait does not require mixing because it is not an aerosol or liquid spray. The homeowner does not have to clean out cabinets or cover kitchen surfaces before using the bait. The insecticide is contained in a child-resistant, plastic container so humans and pets are not exposed to toxins. The bait does not smell and is not volatile. The bait must be placed properly to be effective. Put the bait where you have seen the bugs. Under toilets, sinks, beneath stoves, dishwashers and refrigerators, inside storage areas and cabinets and next to trash cans are the places where these bugs like to hang out. Put the bait in these locations. Put out 12 baits at one time, including two in the bathroom (or two in each bathroom in your home) and the remainder in the kitchen. You may notice a reduction in the population within a week or it may take up to three weeks. You can use boric acid to combat this problem. However, it must be used correctly. Read the instructions. It can be used in conjunction with bait or alone. You don't have to use much and it remains potent indefinitely as long as it doesn't get wet. The way boric acid kills the roaches is by adhering to their body when they walk over it. The roaches then lick it of, ingesting it. the acid is also absorbed through the outer covering of the roach's body. The roaches will return to the boric acid repeatedly until it kills them. Fortunately, boric acid, although highly toxic to roaches, has a low toxicity level in regard to animals and pets. It doesn't smell and it isn't volatile. However, you should never directly apply boric acid to counter tops or any area where food is prepared.